Submitted 1 month 2 days ago by hotrod. Buck Gardner Double Nasty II Duck Call Range of a single-reed call with an extra-raspy sound Hand-sanded tone board Hand-cut reeds Individually hand-tuned The Buck Gardner Double Nasty II Performance Series is Buck's version of the double-reed. 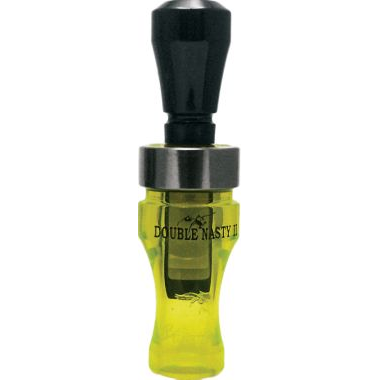 The Double Nasty II duck call has the range of a single-reed call with an extra-raspy sound that just gets nastier the harder you blow. Hand-sanded tone board, hand-cut reeds and individually hand-tuned. Colors: Blue Pearl/Fluorescent Green, Camo Green, Fluorescent Green/Black Pearl.